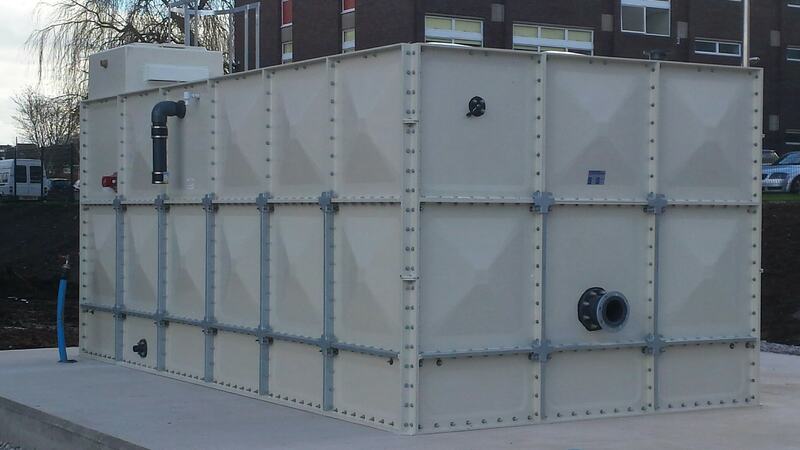 To supply, deliver, offload, position and install a GRP hot press externally flanged sectional tank. The water tank is required for use with a sprinkler system and required to comply with LPCB regulations. The client requested a water tank to work in conjunction with a fire sprinkler system. A Sprinkler system is a water supply projection system, providing a constant flow of water at an adequate pressure which is distributed through a piping system for sprinklers. The water source tank required LPCB certification to ensure adequate testing has been undertaken to ensure constant water supply at pressure will be available for fire protection regulations. Dewey Waters have been manufacturing tanks for 60 years, and are leaders in water tank construction & installation. Our water tanks have passed LPCB regulations is an assessment from “The Loss Prevention Certification Board” (LPCB) which is a leading international certification body in the area of fire defence and protection. LPCB certifications are an international Certification Body in the fields of security and fire protection. Dewey Waters water tanks have LPCB approval which is trusted by governments and regulating authorities, throughout Europe Asia-Pacific and the Middle East. The product assessment is set by industry experts including regulators, insurers, designers, manufacturers, installers, engineers and scientists. Certification of products is based on tests undertaken by LPCB testing laboratories. This certificate is renewed by regular audits to ensure the standards continue to meet the approved criteria. 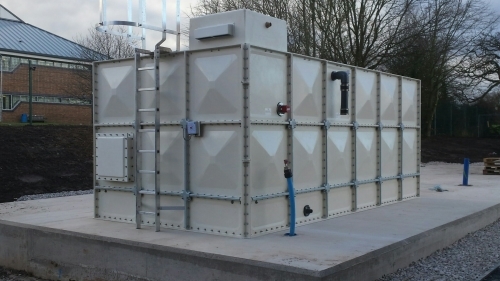 A 6.00m x 3.00m x 2.50m High LPCB approved sectional water tank was manufactured, delivered offloaded and installed by our crews on the grounds of Deeside College. also known as Coleg Cambria in North East Wales. This is one of the largest colleges with over 7,000 full-time students and 20,000-part-time pupils. The fire protection water tank holds a total capacity of 45,000 litres nominal. The project was undertaken over the holiday period and required completion before the holiday term ended to reduce any disruption to the college and ensure they were approved for fire protection before students returned in 2016. The sectional water tank was delivered on the 6th of January and the tank was fully installed on the 11th of January.